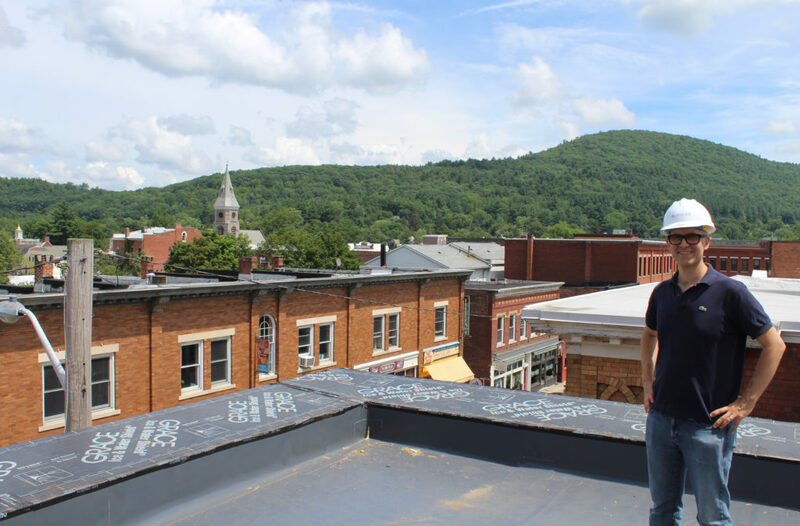 Sam Nickerson, of Framework Properties, on the roof of 47 Railroad Street where he and his partner Ian Rasch are fashioning a residential and retail complex that will transform the top of Railroad Street and the alleyway between Railroad and Castle streets. Great Barrington — It won’t be long until Railroad Street hums with even more activity than it does now. The dense urban feel of eclectic Railroad Street already attracts an array of hipsters, diners and tourists. But by the end of the winter, when 47 Railroad Street opens its doors, you can add the residents of 13 market-rate apartments and at least one more restaurant to the mix. The space at the top of Railroad Street became available a couple of years ago when the old Mario’s Tuscany Grill closed (before the restaurant was called Mario’s, it was Fiori and before that, Pearl’s, depending on how far back you go). Eventually Sam Nickerson and Ian Rasch of Framework Properties envisioned a mixed-use development of the property that included 12 market-rate rental apartments and up to five retail spaces. After making a presentation, the partners were able to snag a special permit from an enthusiastic Select Board last October and off they went with the $5 million project that included demolishing the building behind Mario’s and putting up a three-story structure that will house many of the apartments. Plans expanded slightly when the adjoining Martin’s Restaurant closed after a kitchen fire damaged it and Framework purchased the space for a little more than half a million dollars. In all, the current space is set to increase from about 11,000 square feet to 18,400 square feet. The project has the potential to either transform Railroad Street or diversify it, depending on your point of view. The apartments will add to pedestrian traffic and the retail outlets will contribute to the downtown business climate. The alleyway that runs between 47 Railroad and the building that houses Crystal Essence will be preserved and opened up and will become more vibrant, thanks to the new development that includes one-, two- and three-bedroom apartments. This will create what Rasch has called a “new pedestrian corridor” between Railroad and Castle streets. “The alley between Castle and Railroad streets is a dead alley,” Rasch told the selectmen back in October. Not anymore, it won’t be — if all goes according to plan. The alley runs south right between the old Great Barrington firehouse and the Mahaiwe Center for the Performing Arts. Asked if he and Rasch had ever considered making the firehouse part of their project, Nickerson said they are interested but have not been able to work out a deal with owner Thomas Borshoff. Borshoff, a retired former CEO and president of First Federal Savings and Loan Association of Rochester, took the firehouse off the town’s hands for a mere $50,000 in June 2014, insisting he wanted to redevelop the 117-year-old building that was vacated in 2009 when the fire department moved into its new $9-million facility on State Road. The town continues to rent back office space from Borshoff for its health and building departments, even as Borshoff has done little work on the building. The town is eager to move the two departments out of the decrepit building and has even issued a request for proposals to sublet the spaces until its lease runs out in 2020. Meanwhile, Nickerson could barely contain his excitement about the 47 Railroad project. Workmen from Alander Construction were in practically every corner of the building. On the tour he gave this reporter, Nickerson pointed to the development’s energy-efficient features and its large windows, including four large window bays in the ground-floor restaurant space with grand views of Railroad Street. The restaurant space has been enlarged from the original plans, thanks to the acquisition of Martin’s, which enabled Framework to take out the wall that had divided Martin’s and Mario’s. Upstairs is perhaps the most striking feature of the project. There will be what Nickerson said are 13 “well-appointed” apartments on the second and third floors. The fixtures and appliances are sleek and designed to appeal to millennials or perhaps even hip retirees who like the idea of simply taking the new elevator downstairs to dine at one of many restaurants within a 60 to 90 second walk. When the project is finished there will be four dining choices on Railroad Street alone: Allium; Bizen; 20 Railroad Public House; and the as-yet-unannounced eatery going into the space that formerly housed Seeds. And over the second floor of the building facing Railroad Street will be a large rooftop deck or patio. The deck resembles an outdoor space at a fancy Manhattan penthouse but it will be communal — for the use of all residents — and can even be rented out for parties. “There will be great views not only of Railroad Street but of East Mountain,” Nickerson said. Both Rasch and Nickerson have a passion for adaptive reuse of historic buildings, so they are going to be selective in terms of which retailer they rent to. Rasch has said the tenants will be “curated,” to give priority to those who will “enliven” the area. That observation was presumably a reference to complaints often heard from business advocates that there are too many banks and real estate firms that don’t bring foot traffic to Main and Railroad streets. Nickerson said he and Rasch have held talks with potential retail tenants but added that it was too early to disclose their identities. And there is already a waiting list for the apartments. Before the building was a restaurant, it was a NAPA auto parts store and before that, a granary. The auto parts store was used as an exterior location for “Before and After,” a movie starring Liam Neeson and Meryl Streep and released in 1996. It seems to me that much of the appeal of our “best small town in America” was that it was NOT “urban living,” and that second home owners sought a respite FROM their urban environment here. That local off-season support is important for all businesses and restaurants at a time when fewer locals venture ‘downtown,’ that staffing for restaurants and retail shops is increasingly hard to find since high rents drive our young folk out of town, that limited parking continues to frustrate shoppers, that downtown traffic is already dangerous for pedestrians and that slow and congested traffic continues to trouble our ‘greater’ downtown area, are issues that further urbanization do not address. And none of these issues will improve or be mitigated by further ‘urbanization’ of downtown. The (once rural) Hamptons already exist. And GB’s growth seems to be twinning it. It is a change that deeply saddens me. What will become of Martin’s? Barbara, apparently you haven’t been to Gt Barrington in the last year. Martins closed and never reopened after a fire about two years ago. These developers bought the whole corner block. Thanks so much– I haven’t. A family member fell ill and being caregiver I scarcely left home the past few years. Can’t wait to get back, though. Other than this recent absence, I’ve been “doing” Railroad Street, from the Snap Shop to Martin’s for 30-odd years. Where will these residents be parking their cars? The reuse of existing buildings is not urbanization. It is revitalization. Sam and Ian are embarked on a bold and exciting plan to update a cluster of buildings to meet the current demands. The term that may be more relevant is gentrification, but that is a reflection of ongoing changes that date back 40 years. Adding housing units will only support Great Barrington’s year-round sustainability as a vibrant commercial center. Economic inequality is the defining issue of the southern Berkshires, but this project is more likely to mitigate it than exacerbate it even if on the surface it appears otherwise. I, too, am skeptical and saddened. We not only have the Railroad Street project which involves rentals but also the old Searles School that I thought would be a hotel and the new construction about to start at the Co-op. Are all these new “housing” units sustainable in Great Barrington? Of course, Railroad Street, being the first, will be of interest to many renters. The article already claims that they have a waiting list. But as Nancy F. asked, what about parking? It’s very difficult to find parking anywhere on Railroad in the summer after 11:30 a.m. even for shoppers or those seeking lunch or dinner. The area where behind the Railroad Public House is generally filled, especially in the summer. Not all customers can walk long distances to get to Railroad Street. Lastly, what does tenants will be “curated” to ensure that they are lively enough (to be able to shop or eat ) mean? Is this even legal. It smacks loudly of discrimination. And then there are the winters. Yes, we have some who come to ski, but they hardly match the summer crowds that help Great Barrington businesses and restaurants thrive. What happens when the other locations in the area of the Co-op open? Are we destroying our wonderful small-town way of living? Are we freezing out the locals? Cold weather that comes with winter can last a very long time. By “curated tenants” they are referring to the businesses that rent the commercial spaces. Their goal is to ensure there are more shops to shop in and not more real estate offices and law offices (although those are important too) they are not referring to curating the people who intend to rent the apartments. They want to bring more to the railroad street corridor and liven up a building that has had a lot of turnover, and break it down into smaller shops so people can afford to rent the spaces to open up new businesses which will then create more jobs and more local dollars to go around. I truly hope that Erik’s sentiments re: mitigating economic inequality actually portend as accurate. But this project disturbs me in that it smacks of social elitism: “curated tenants”?! I think I understand their intent, but i still don’t like it. Economic inequality IS a real issue and I do not see how this project in any way helps to level the playing field. Those who have the Big Bucks will get he apartments, and heaven knows who the retailers will be? Another shop with a nearly $300 rope swing? Some good points and questions; however, Should these buildings be left vacant or be restored and occupied with businesses and tenants who will be on the tax roles? Perhaps this project may lead to resolving the fire house fiasco. Way back when, there were multiple concerns about the shopping center on South Main (Zayres was the anchor store) and later the shopping center on Route 7 killing the downtown. You can’t have it both ways. I think they are turning Gt. Barrington into NYC! Not liking it at all. I manage a retail store on Railroad Street, and frequently get asked quite pointed questions about this development. I will always answer honestly, and with enthusiasm. Honestly? I am looking forward to the feeling of vibrancy that this project will no doubt bring to a street that gets quieter every year. New retail options and increased foot traffic can help lift all businesses nearby. I am giddy about the possibilities. I love it when customers ask me if an item or service is available in town, and more often than not, I can help direct them to a local store, often within walking distance. Wouldn’t it be fantastic if every local who decries ‘the urbanization’ of our central shopping district would first take a walking tour of this area. It may have been longer than you think since you have passed through our doors, and we welcome you back. Check what great merchandise, gifts and services are available. You might be surprised at what you find. $300 wooden swing bugaboos aside, there is much to be proud of along the path that you walk to your favorite coffee shop. Try us! I welcome more shops into our community, perhaps you should too. I would propose that This ‘urbanization’ effort is really a step to what we all want. A thriving, vibrant, diverse community. Why should these changes sadden anyone? If you want a healthy hometown economy; support the efforts of our business community. I can’t wait for March.